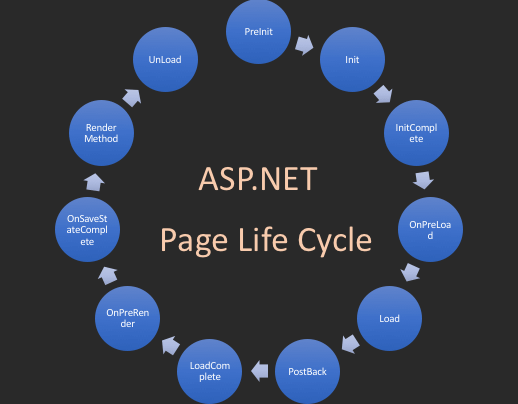 This article describes various stages or events of an ASP.NET page life cycle. 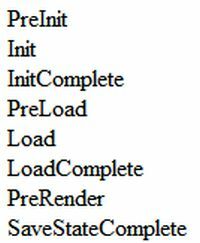 ASP.NET Page Life Cycle includes events PreInit, Init, InitComplete, OnPreLoad, Load, PostBack, LoadComplete, OnPreRender, OnSaveStateComplete, Render, and UnLoad. When an ASP.NET page runs, the page goes through a life cycle in which it performs a series of processing steps. 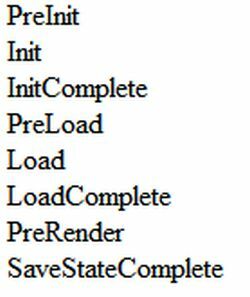 These include initialization, instantiating controls, restoring and maintaining state, running event handler code, and rendering. 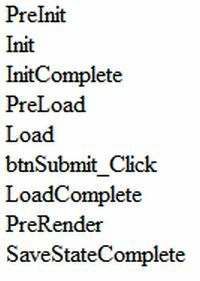 The following are the various stages or events of ASP.Net page life cycle. If the request is a postback then the values of the controls have not yet been restored from the view state. If you set a control property at this stage, its value might be overwritten in the next event. Each control's UniqueID is set and any skin settings have been applied. The "Init" event is fired first for the bottom-most control in the hierarchy, and then fired up the hierarchy until it is fired for the page itself. Until now the viewstate values are not yet loaded, hence you can use this event to make changes to the view state that you want to ensure are persisted after the next postback. 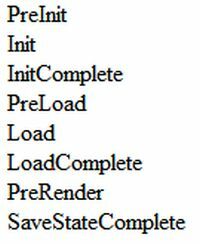 Use this event for processing tasks that require all initialization to be complete. Before the Page instance raises this event, it loads view state for itself and all controls, and then processes any postback data included with the Request instance. Loads ViewState: ViewState data are loaded to controls. Loads Postback data: Postback data are now handed to the page controls. This is the first place in the page lifecycle that all values are restored. Most code checks the value of IsPostBack to avoid unnecessarily resetting state. You may also call Validate and check the value of IsValid in this method. You can also create dynamic controls in this method. ASP.NET now calls any events on the page or its controls that caused the PostBack to occur. This is just an example of a control event. Here it is the button click event that caused the postback. 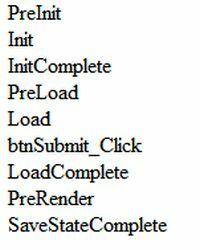 Raised after the Page object has created all controls that are required in order to render the page, including child controls of composite controls. 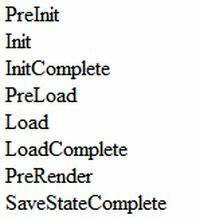 The PreRender event of individual controls occurs after the PreRender event of the page. Allows final changes to the page or its control. This event takes place before saving ViewState, so any changes made here are saved. For example: After this event, you cannot change any property of a button or change any viewstate value. Use the event to make final changes to the contents of the page or its controls. Raised after view state and control state have been saved for the page and for all controls. Use this event perform tasks that require the view state to be saved, but that do not make any changes to controls. This is a method of the page object and its controls (and not an event). This event is used for cleanup code. At this point, all processing has occurred and it is safe to dispose of any remaining objects, including the Page object. This event occurs for each control and then for the page. 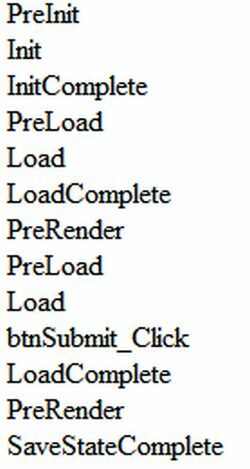 During the unload stage, the page and its controls have been rendered, so you cannot make further changes to the response stream. If you attempt to call a method such as the Response.Write method then the page will throw an exception. In the following code, I have assigned the values to the label control on each event. When you run the code, you will see that in the "Page_UnLoad", the values are not assigned to the label. WHY? 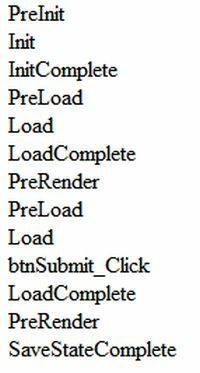 Because, during the unload stage, the page and its controls have been rendered, so you cannot change the values. Please observe the code comments and output. It will help you to clearly understand the concepts. //Work and It will assign the values to label. //If the page is post back, then label contrl values will be loaded from view state. //E.g: If you string str = lblName.Text, then str will contain viewstate values. //But "SaveStateComplete" values will not be available during post back. i.e. View state. //Work and it will not effect label contrl, view stae and post back data. //Convert.ToString(ViewState["value"]) will always have post back data. //E.g: If you string str = Convert.ToString(ViewState["value"]), then str will contain post back values. //Work and it will not effect label contrl values, view state and post back data. //Runtime Error : Response is not available in this context. Note: If you write Response.Write("<br/>" + "UnLoad"); in the Page_UnLoad event, then it will genenrate the Runtime Error "Response is not available in this context".